WESTBROOK — Waterstone Properties Group is looking at developments nationwide to find the right look and feel for Rock Row, the ambitious commercial, residential and recreational center planned for the former Pike Industries quarry. “We can’t pick up any one of those and just drop it into the community and expect it to work. It needs to match the needs in the community,” Josh Levy, a principal of Waterstone Properties Group told the Planning Board last week. The Waterstone team, Levy said, has connected with a number of groups in the area to determine what they would like to see in the complex on the 100-acre property at 58 Main St. next to the Portland line. Waterstone developed the Bob’s Discount Furniture and Marshall’s/HomeGoods complex on Gallery Boulevard in Scarborough. Waterstone is scheduled to appear before the board again Aug. 21 to seek a site plan amendment for the first phase of the project, which will include an 80,000-square-foot Market Basket. Levy said the supermarket, which will be Market Basket’s second location in the state, will open in fall of 2019. The other retail tenants have not been made public, but Levy said Waterstone has spoken with Starbucks and Chick-fil-A about locating in the development. City Planner Jennie Franceschi said the Planning Board’s August review will be a “melding” of the plan the board approved in October 2016 when a Wal-mart was proposed by a different owner and the site plan Waterstone Properties Group has in mind for the Market Basket and other retailers. Levy said the nearly 496,000-square-foot retail shopping plaza would be located at the corner of the property across the street from the Kohl’s/Shaw’s shopping plaza. 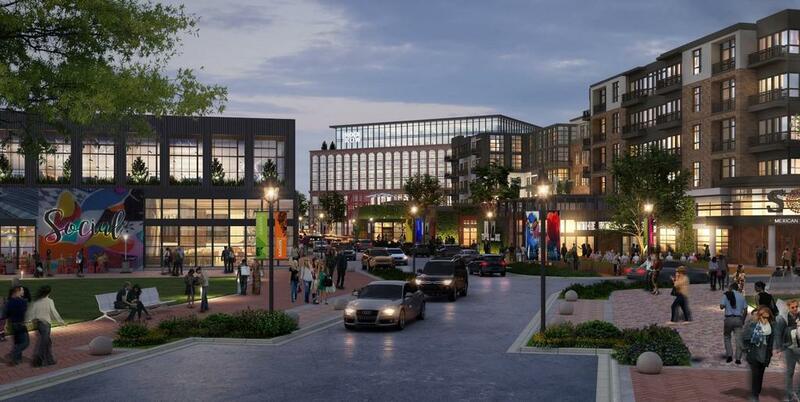 Waterstone envisions much more than just retail for Rock Row and is in the midst of marketing the property to national, regional and local businesses. Plans include a 26-acre recreational area at the quarry; an 8,200-seat concert venue at the corner of the property by Westbrook Arterial and Larrabee Road; a 12-screen movie theater; 300,000 square feet of office space; 750 residential units; two hotels; 100,000 square feet of primary care, specialty care and rehabilitation offices; an outdoor plaza for ice skating or outdoor movies; and a 25,000-square-foot brewplex and food hall. Levy said Waterstone is finalizing a deal with the movie theater. The residential units, he said, would be marketed to millennials or empty-nesters and be phased in over a 10-year period. The second phase of the project, which could be phased in between 2020 and 2023, would include the residential and commercial units, as well as the movie theater, “beerplex” and outdoor plaza. One hope, Levy said, is to tap into the railroad track and infrastructure in place to connect the property via a trolley service to downtown Westbrook to the west and Thompson’s Point/the Amtrak station and eventually downtown Portland to the east. Waterstone is also working with the Greater Portland Regional Transit Authority in terms of Metro bus connection and with the Portland Trail system to connect to the 60 to 70 miles of trails that surround the site. Plans include forging connections over Nason’s Brook to Jewell Falls in Portland or to the trail system that passes by the Animal Refuge League of Greater Portland off Stroudwater Street. Phil Spiller, the vice president of Discover Downtown Westbrook, thanked Waterstone for the support it has given to downtown events thus far and their willingness to be part of the fabric of the Westbrook community. “People are amazed about what’s potentially going to be happening in Westbrook, with your approval,” Spiller said. Levy said the goal with the Rock Row development is simple: create a place where people want to come and spend time. “Our product here is the experience more than anything else,” he said. Planning Board member Robin Tannenbaum said it “is too early to have any specific feedback,” but that she is excited about the prospects. “It’s really impressive. I am excited to see how this develops. I appreciate the attention on community and focus on sustainability,” she said. She did suggest outfitting some of the flat roof space with solar panels. In an effort to better understand what sort of impact a development like this would have for police, fire and emergency services, Westbrook Police Chief Janine Roberts asked Levy to provide to her a list of the venues Waterstone is looking to for inspiration so she can connect with the police departments in those communities. Roberts said she will connect him with someone she knows who has been nationally trained in the concept. Waterstone Properties Group envisions a mixed-use development at the former Pike quarry site, with commercial, retail, residential and recreational offerings. The first part of the development, a Market Basket, is expected to open in summer 2019.